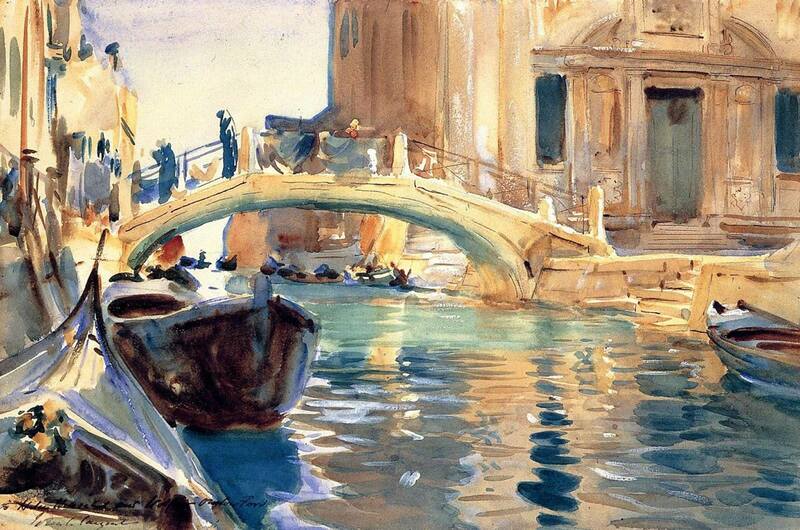 John Singer Sargent⏭ was the most sought-after society painter of the late 19th and early 20th century. But he led a double life. 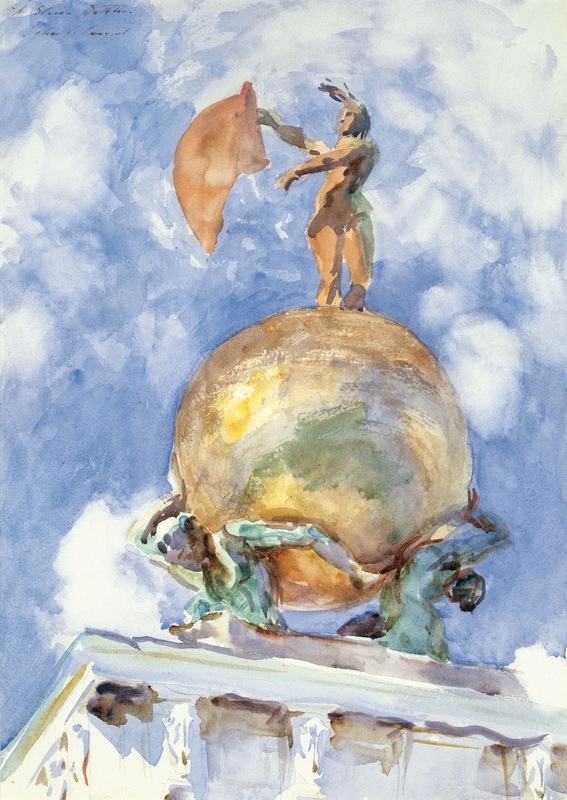 Throughout the nearly 30 years he was occupied with portraiture, he produced hundreds of landscapes and figure studies not intended for public view, seldom seen outside his studio or beyond his immediate circle of family and friends. 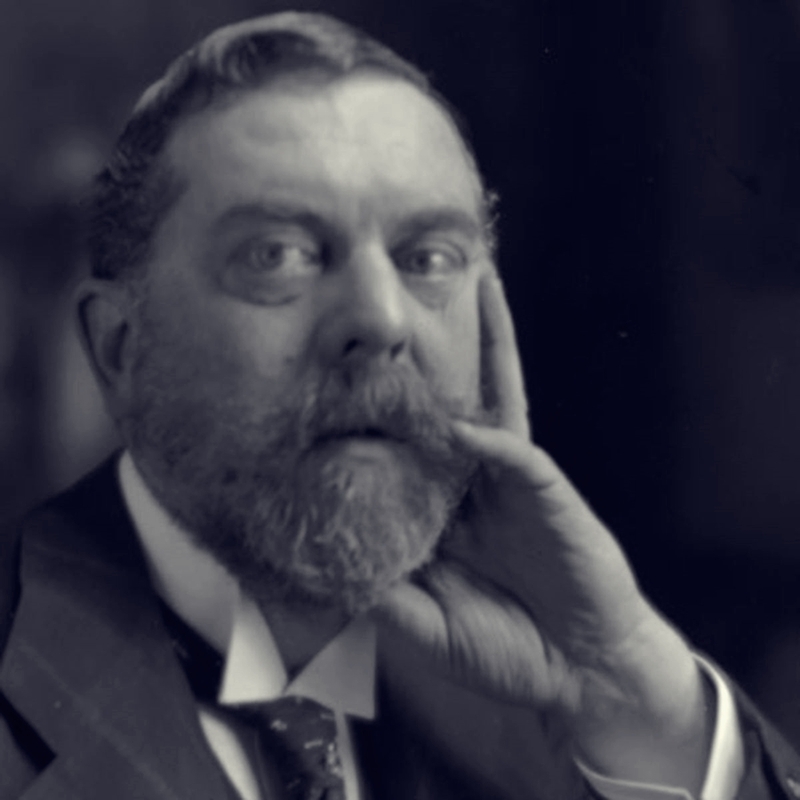 Born in Florence in 1856 of American parents, while growing up he led a peripatetic European existence that continued into adulthood. 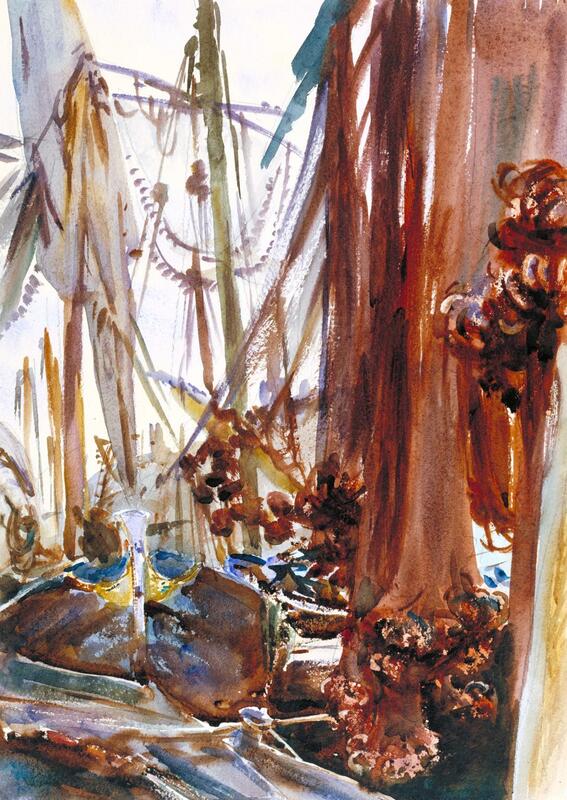 He was constantly on the move, in search of new landscapes and scenes to paint for his personal satisfaction. 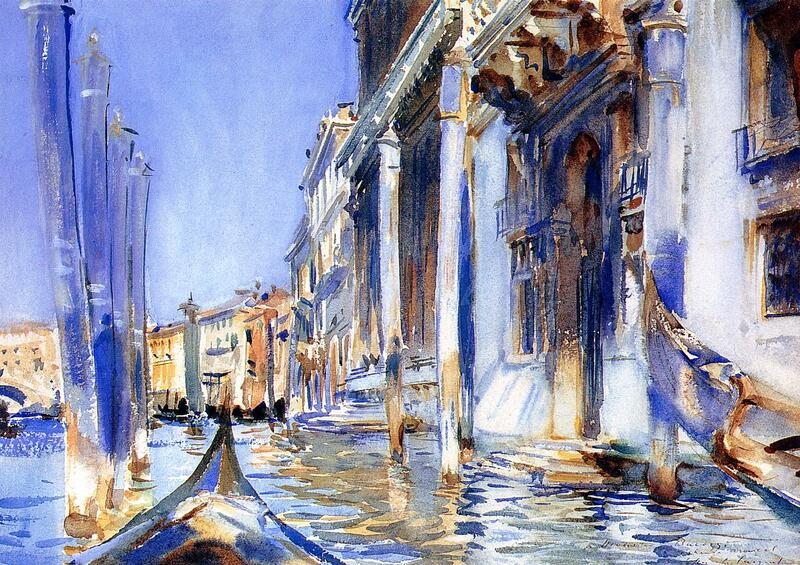 In Venice he found both a long-term challenge to his artistic powers and a kind of spiritual home. Surprisingly, there has until now never been an exhibition devoted specifically to this considerable aspect of his oeuvre. 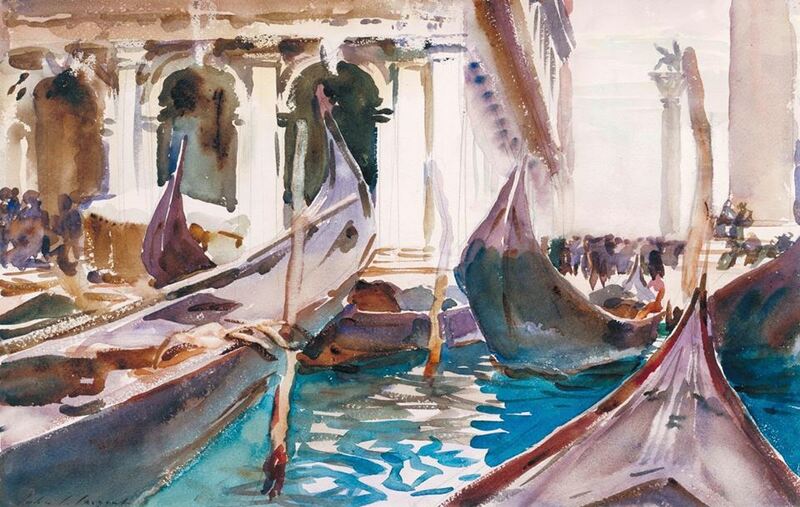 But here at last at the Correr Museum is "Sargent and Venice", a rewarding gathering of more than 50 of his watercolors and oils, many from private collections, along with a pertinent selection of paintings by his native Venetian contemporaries. The show continues until July 22. 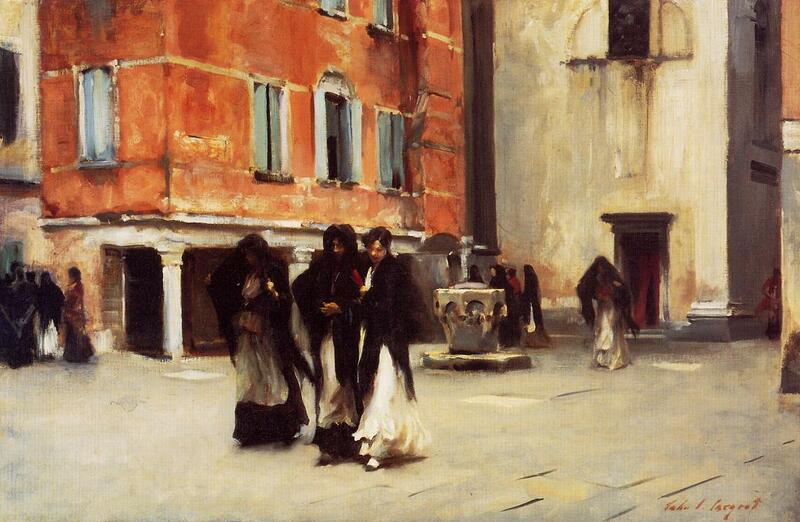 Sargent first painted Venice in the early 1880s. 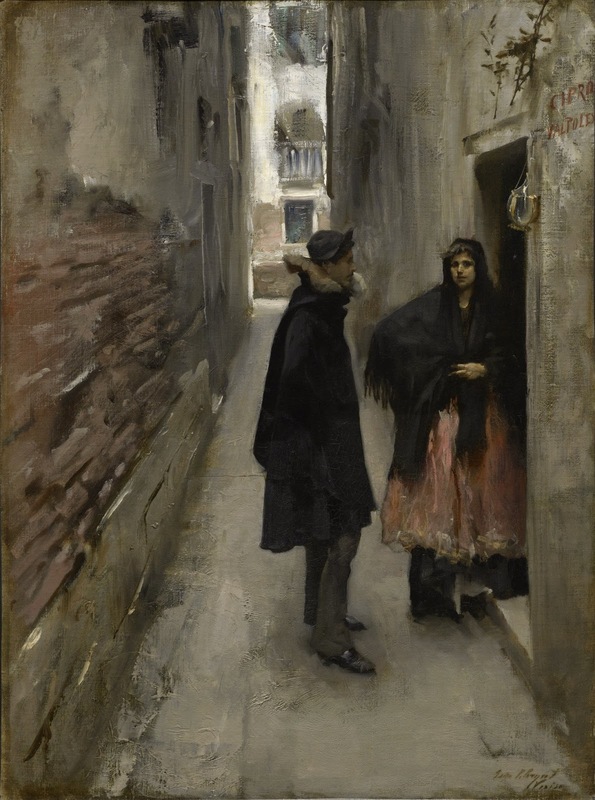 In this "first Venice period" he did some views but, following partly in the footsteps of Whistler, he concentrated mostly on street scenes and interiors, depicting working class Venetians going about their daily business in the city's narrow streets and squares. 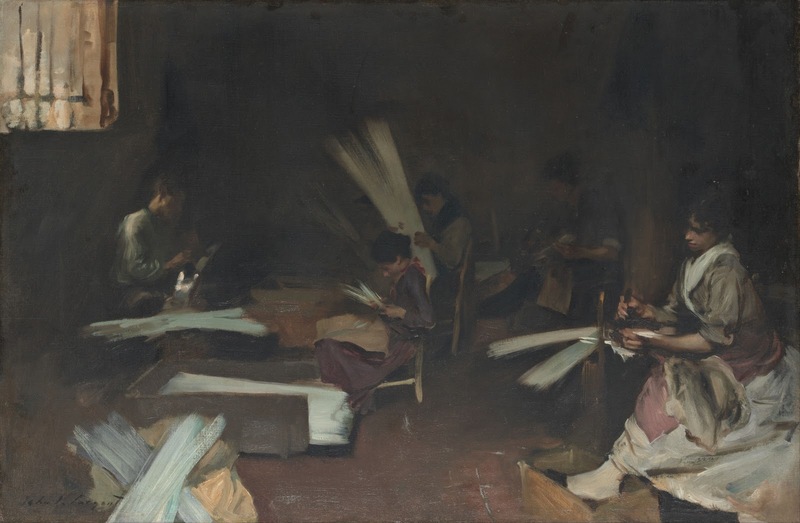 Some of these oils, with their dark palette, bold brushwork and unusual subject matter, were probably executed with the Paris salon in mind although never actually shown there. 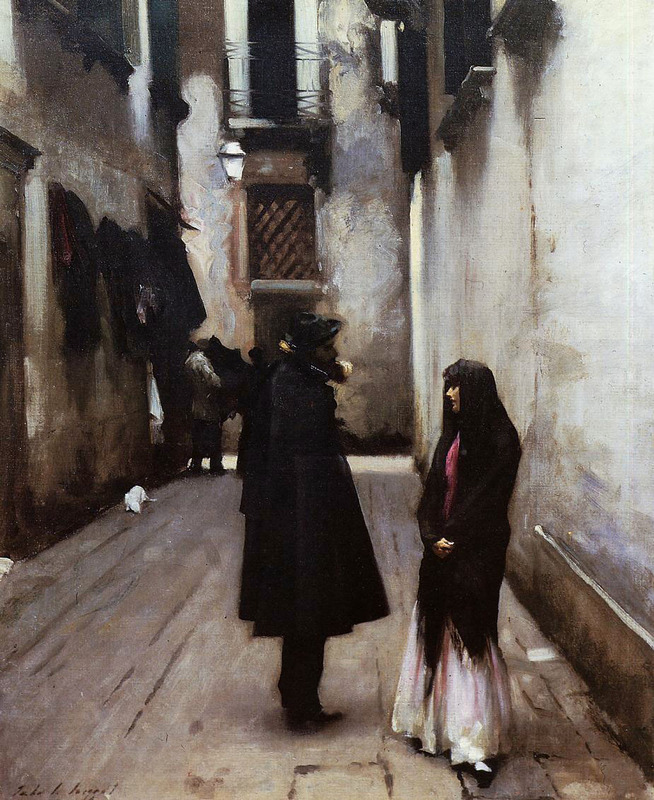 His later Venice pictures, in any event, were to be an almost entirely private pursuit. 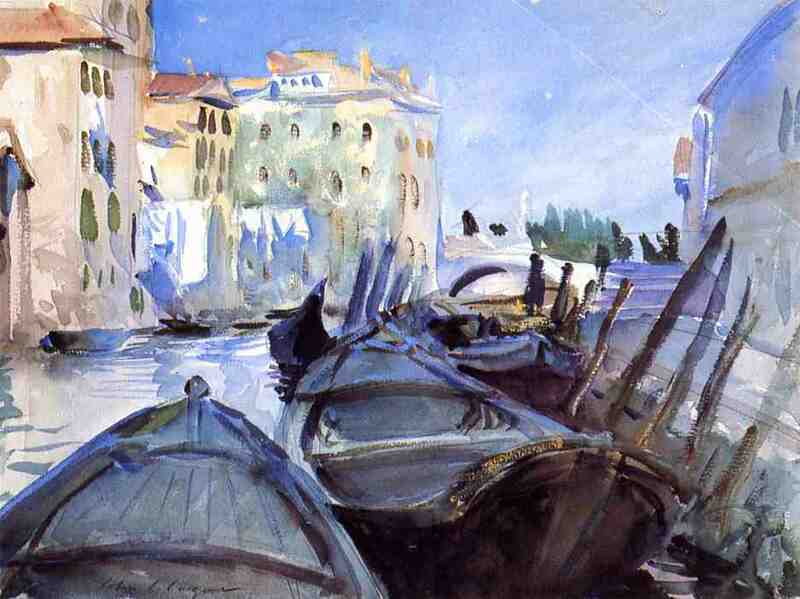 From 1898 until 1913, his "second period" here, he came to Venice almost every year. 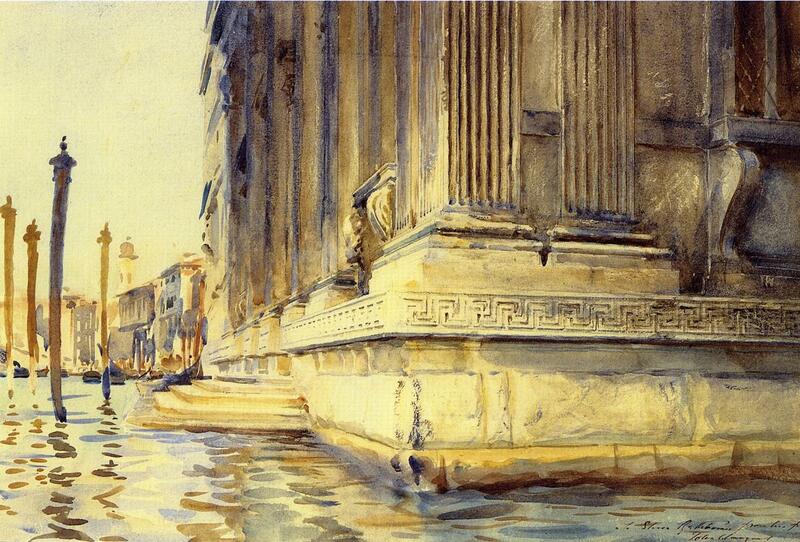 His focus shifted radically to canal and architectural views. 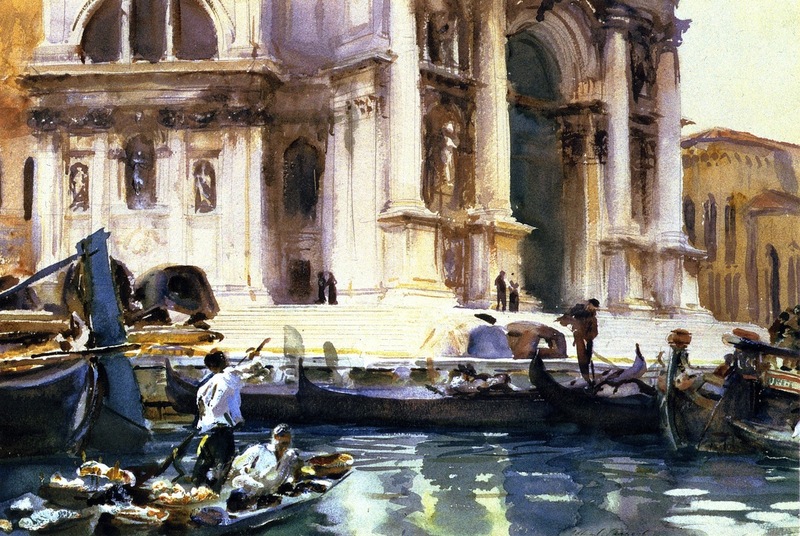 Just about the only human figures are gondoliers, other boatmen and sketched impressions of Sargent's friends in gondolas. 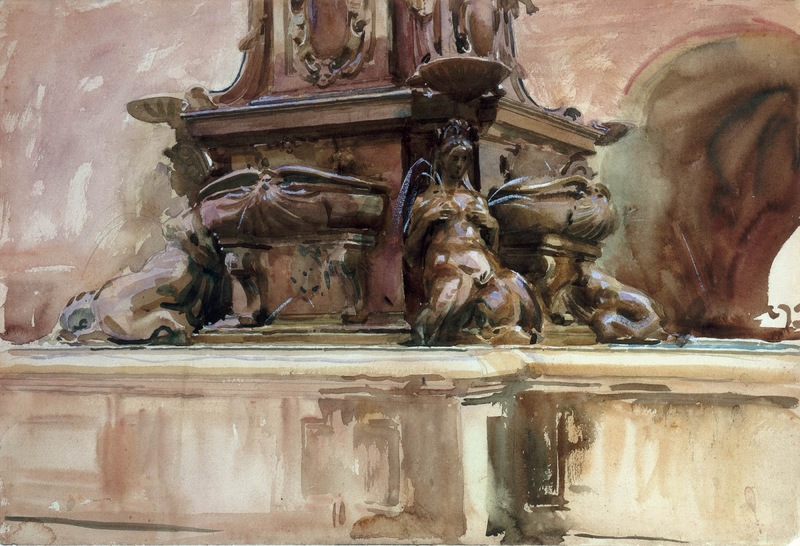 The artist had by this time labored long and hard at depicting water, having painted rivers and streams in France and England, brooks and torrents in the Austrian Tyrol, fountains and pools in Italy and Spain. 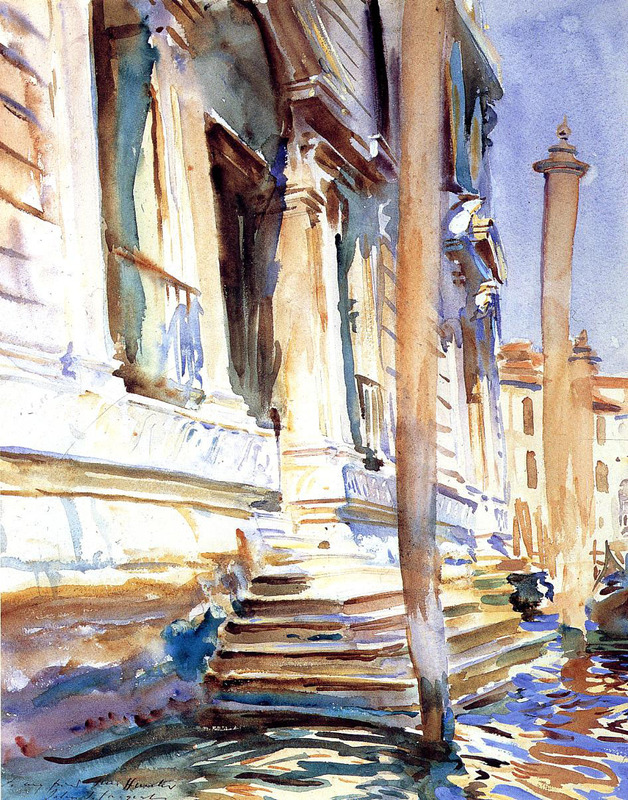 In Venice he stretched his talents to the utmost to catch the fleeting effects of this liquid medium - sometimes to wonderful effect. 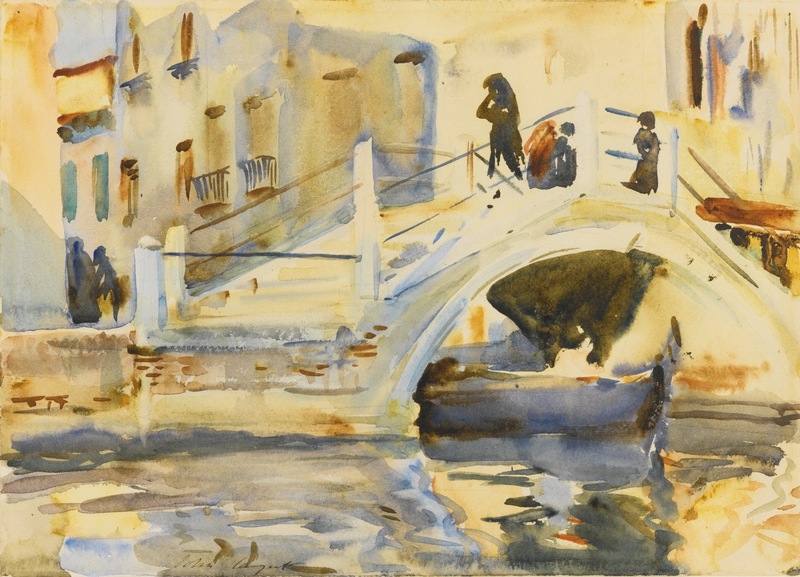 Given the elusive nature of the subject matter, it was inevitable perhaps that he used watercolor for the Venice pictures more than at any point in his career. 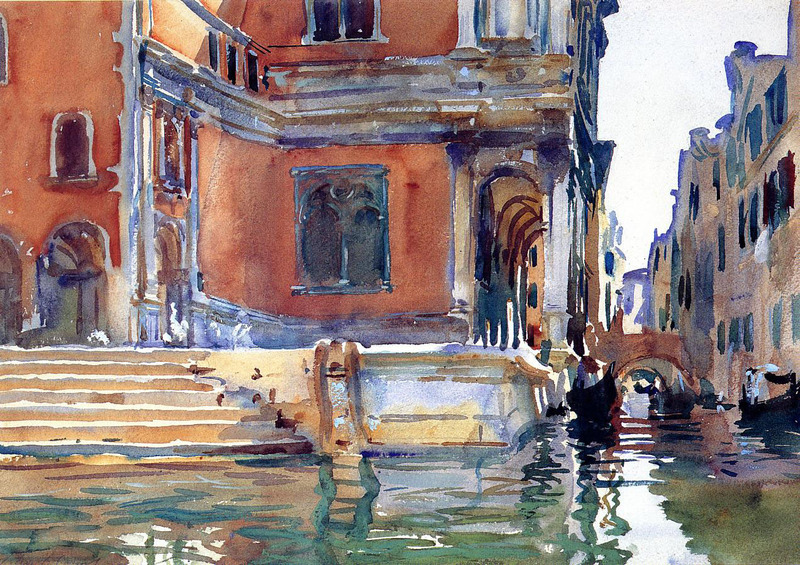 Sargent had passed through an Impressionist period as a young man and he returned to some of its techniques to convey the complex play of light and color upon the water and the buildings of Venice. But he was also an excellent and disciplined draftsman. 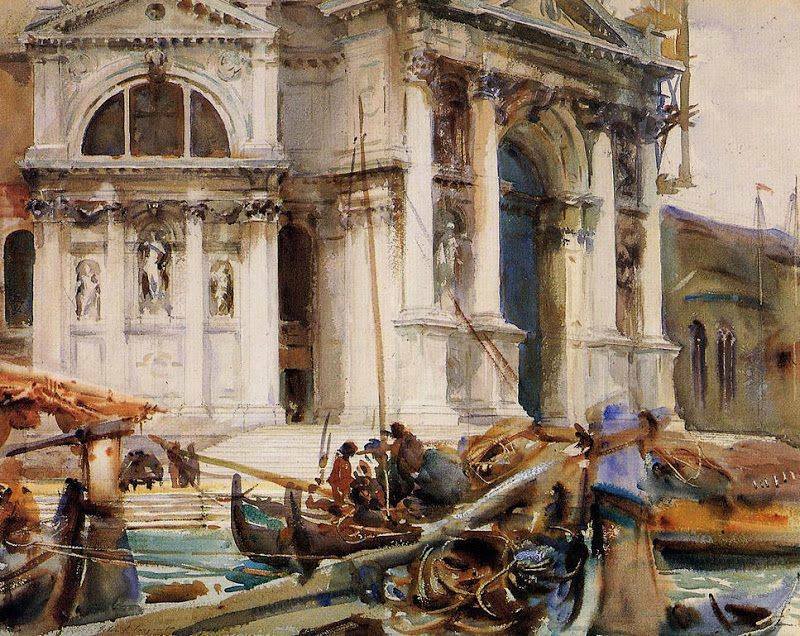 Many of the "second period" pictures are architectural views of the buildings of San Marco, the facades of palazzi on the Grand Canal and of churches - the magnificent baroque basilica of Santa Maria della Salute being a particular favorite. 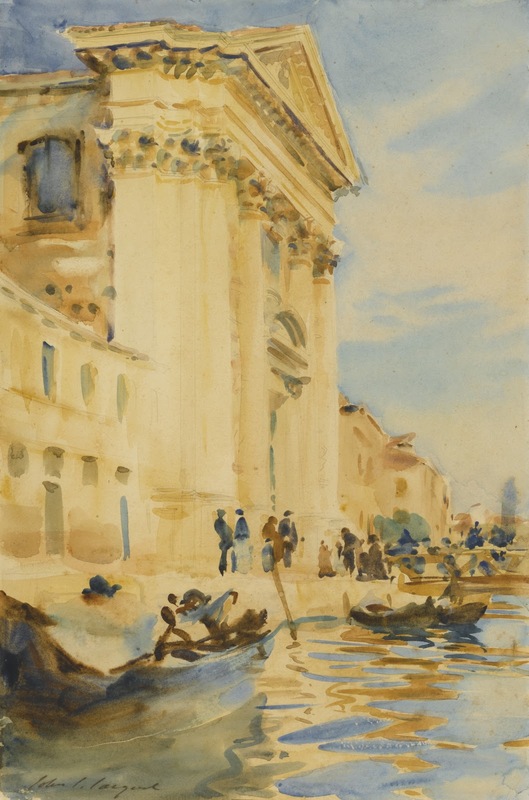 The best of these works offer a rare marriage of architectural precision and impressionistic panache, capturing simultaneously the city's monumental quality and decorative detail and the shifting reflections on the canals and the all-encompassing lagoon. 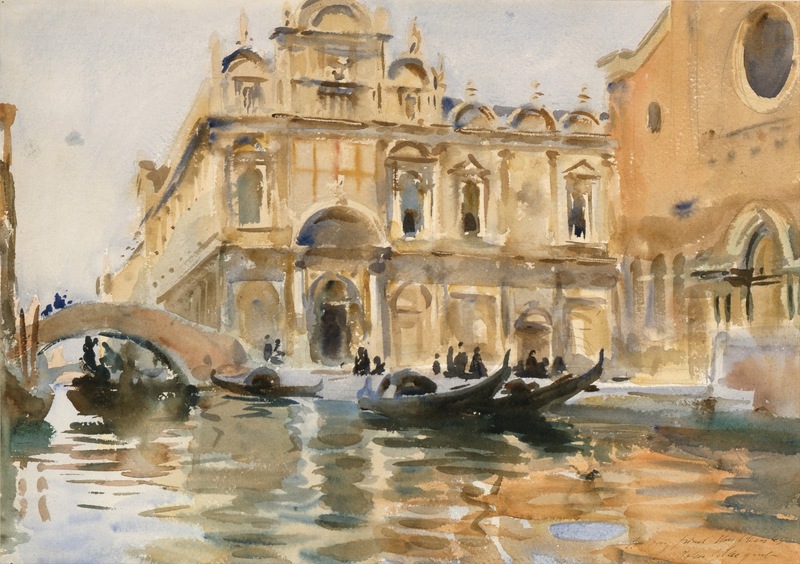 Sargent was distantly related to the Curtises, an Anglo-American family that had taken up residence at Palazzo Barbaro on the Grand Canal. Both he and Henry James, a friend since the two men had met in Paris in 1884, stayed there on several occasions. 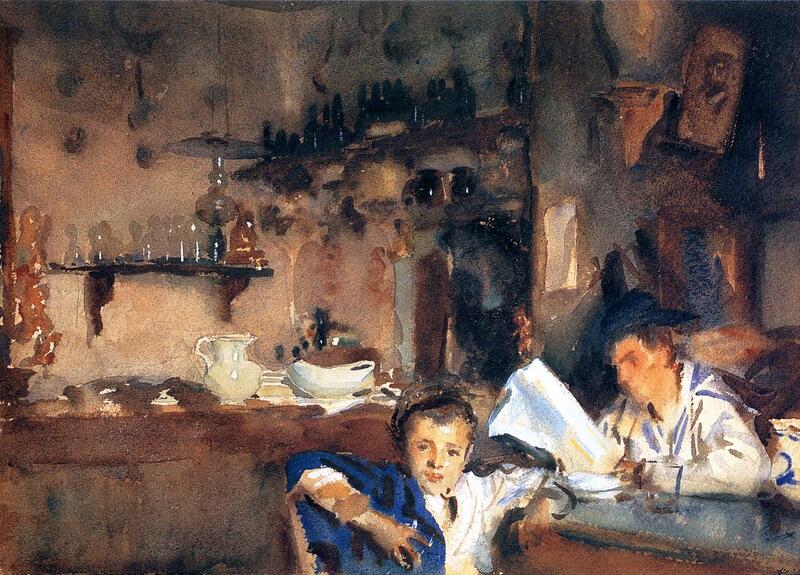 As a mark of his appreciation for the Curtises' hospitality during his visit in 1898, Sargent made an informal portrait in oils of the Curtis parents, Daniel and Ariana, their son Ralph and his young wife taking tea in the grand ballroom of the palazzo. 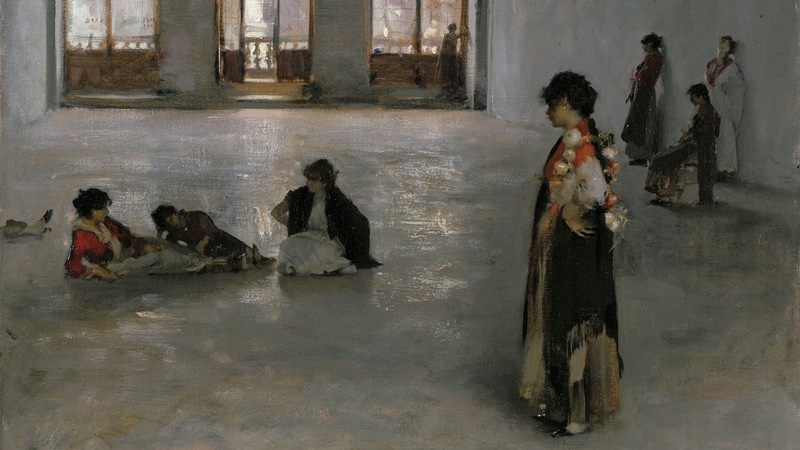 The painting, which later acquired the title 'An Interior in Venice', was to become one of the artist's most famous and oft-reproduced images. 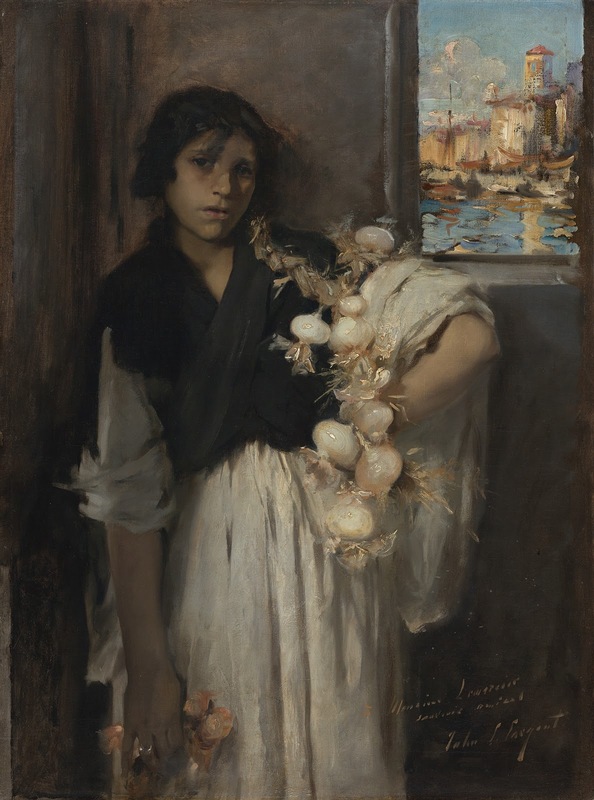 When Sargent presented the picture to Ariana Curtis, she refused it, finding the likeness of herself unflattering and the raffish pose of her son Ralph, hand-on-hip, casually draping himself on a gilded table, "indecorous". Her vanity and prudery were to become the family's loss and the Royal Academy's gain. The artist subsequently gave it to that institution as his diploma picture on being received as a full member, and the Academy has been its owner ever since. 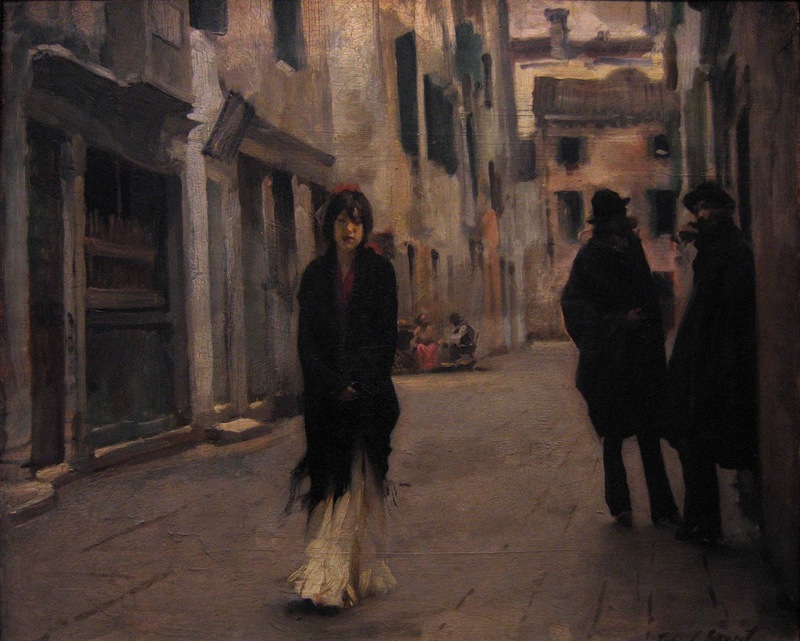 Four years later, in another rare Venetian oil, Sargent infiltrated his upper-class friend Jane de Glehn, in the garb of a proletarian local woman, into his "Venetian Wineshop", a sympathetic rendering of the relaxed informality of a typical lower-class hostelry, almost a low-life pendant to the high-life drawing-room scene of "An Interior in Venice". 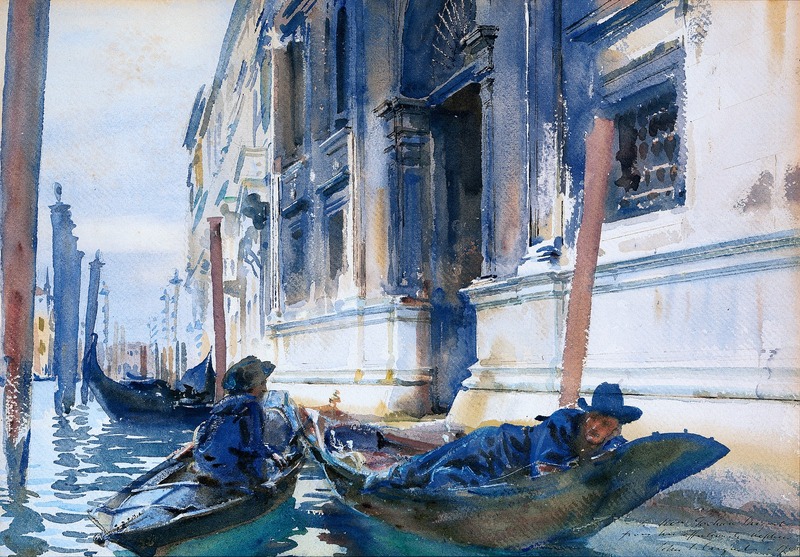 In 1904 Sargent was to do a bravura watercolor of Jane de Glehn, stylishly dressed, elegantly posed and very much the lady, at ease in a gondola gliding along the Grand Canal. 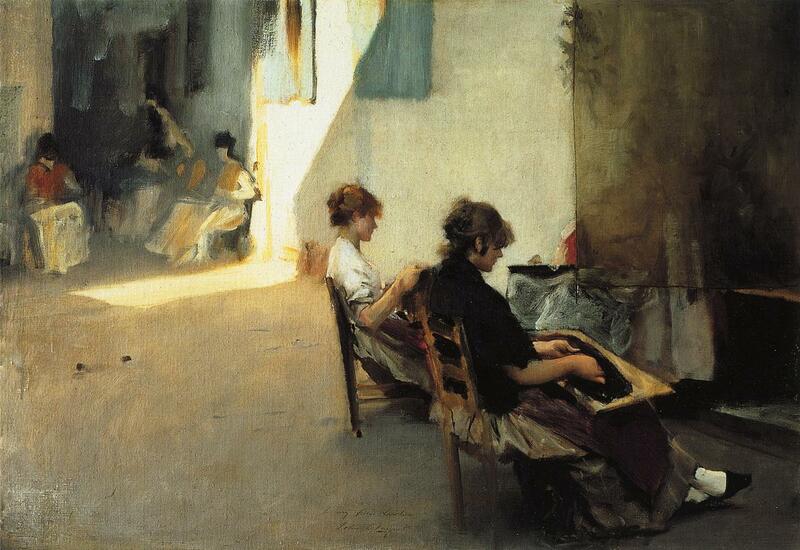 In 1907, to the general dismay of the fashionable, the great and the good, Sargent announced that he was giving up formal portraiture. 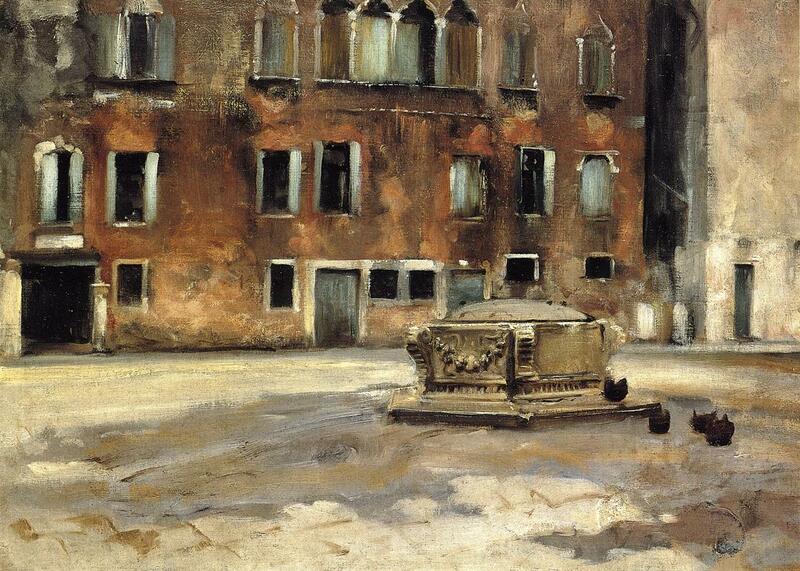 Until 1909 he allowed very few Venice pictures to leave his studio. Before then he exchanged one for a piano - he was a highly accomplished musician - gave a couple to be auctioned for charity and a handful of others to friends. Thereafter, until his death in 1925, a certain number were displayed in intermittent exhibitions, only gradually finding their way into private and public collections. 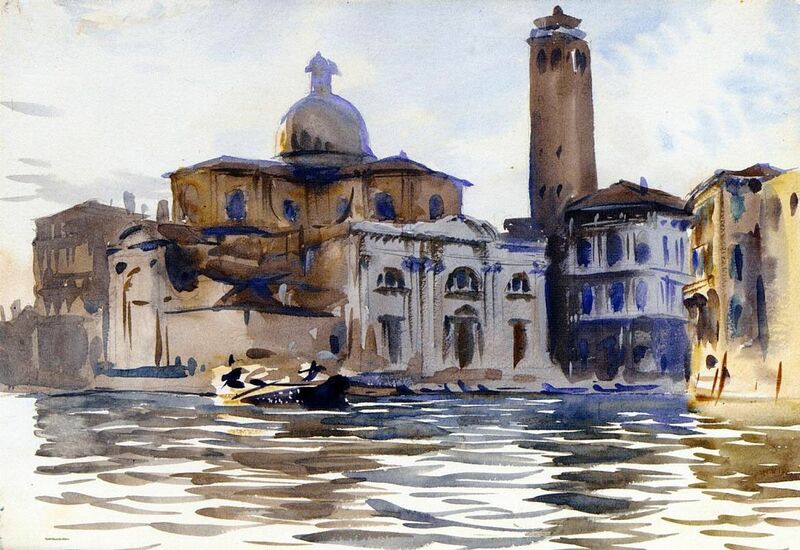 Roger Fry, the critic and member of the Bloomsbury group in London, accused the artist of reacting to Venice "for all the world like an ordinary tourist" - a verdict few who see the pictures today will share. Certainly contemporary buyers and collectors did not concur. 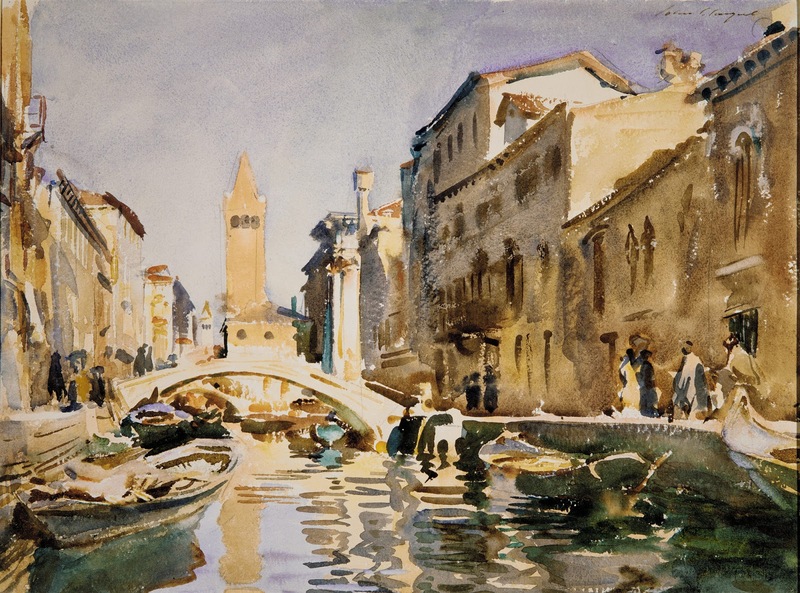 In the two-day-long auction at Christie's of the contents of the artist's studio after his death, the Venice pictures were the subject of frenzied bidding. Venezia è la città dei pittori, da sempre. 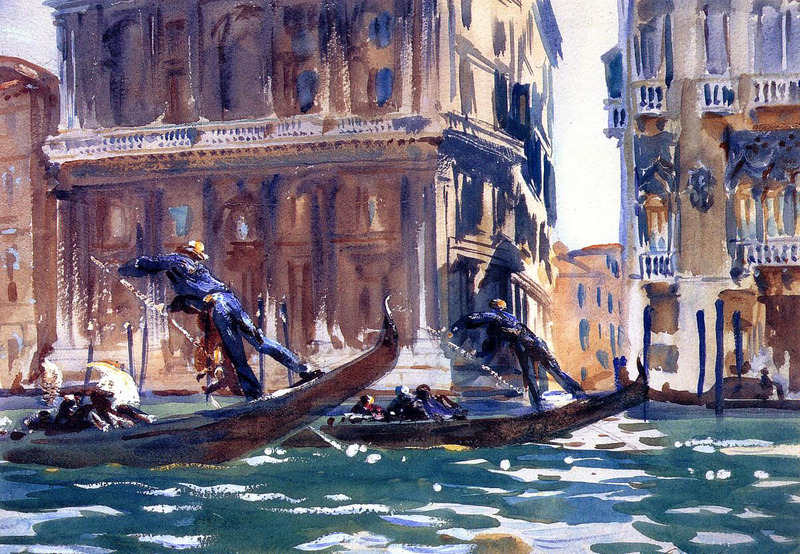 Anche John Singer Sargent (1856-1925)⏭, il maggior esponente dell'impressionismo americano rimase profondamente affascinato da Venezia. 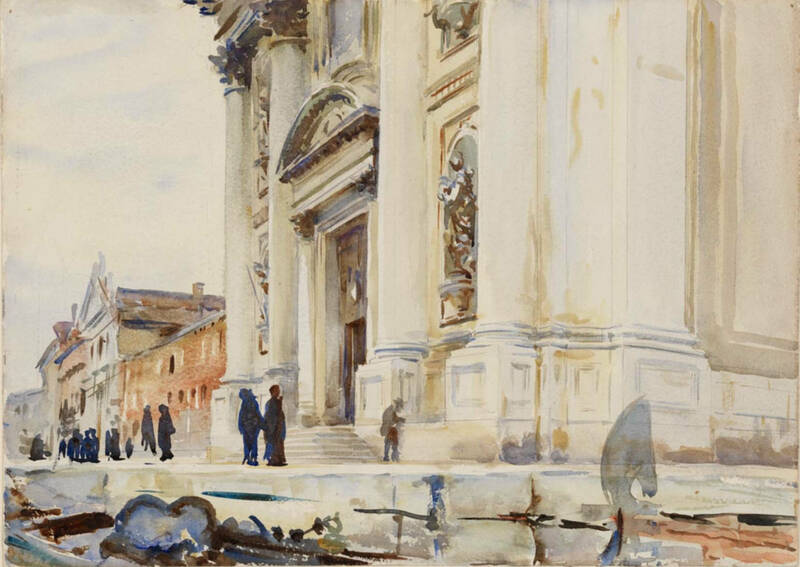 Sargent dedicò a questa città una copiosa produzione di oli ed acquerelli - circa centocinquanta - dipinti tra gli anni ottanta del XIX secolo ed il 1913. 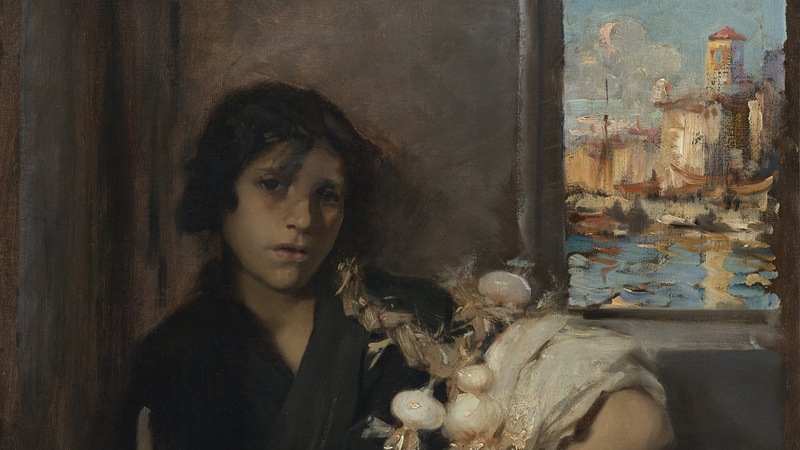 Cresciuto in un ambiente colto e cosmopolita, tra Italia, Francia, Spagna, Svizzera e Germania, allievo a Parigi di Carolus Duran⏭ ed iscritto all’Ecole des Beaux Arts, iniziò la sua carriera come ritrattista. 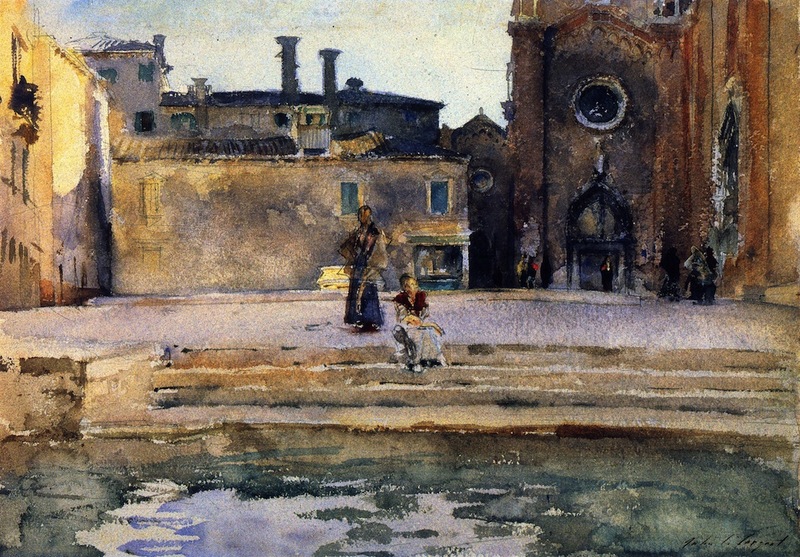 Amico di Monet, intraprende nella seconda metà degli anni ’70 un serie di viaggi di studio e di sperimentazioni sempre più importanti della pittura en plein air. 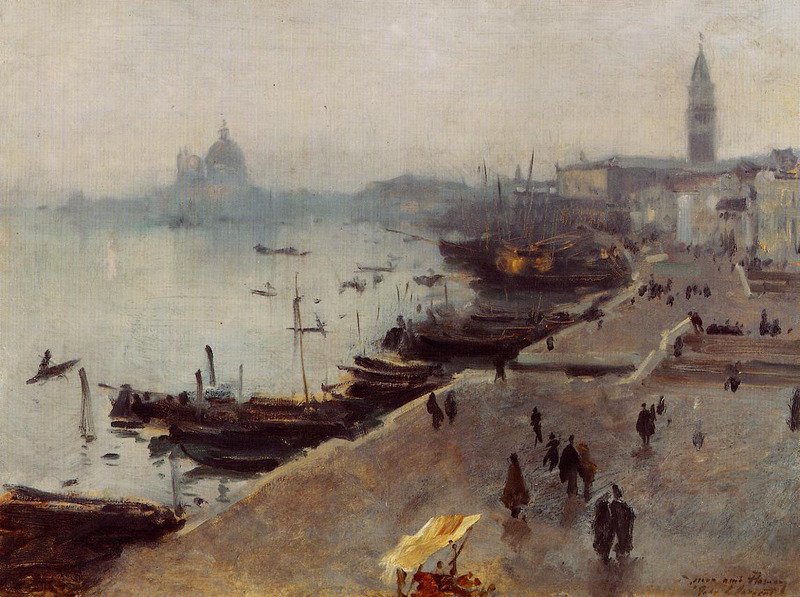 Il primo viaggio a Venezia è del 1870. Vi tornerà per più di dieci volte nell’arco di quarant’anni. 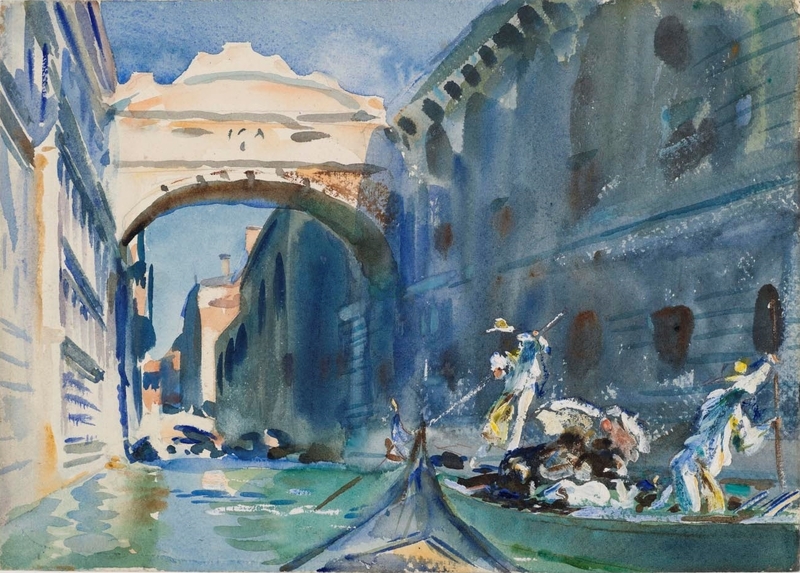 Vi sono rappresentati palazzi, chiese, campi e canali, animati dai riflessi della luce sull'acqua e sulle architetture, ma , accanto alle vedute dei luoghi e dei monumenti più noti -Ponte di Rialto, Palazzo Ducale, Salute-, trovano spazio alcune insolite visioni di vita quotidiana che rimandano alla vita tradizionale della Venezia dell’epoca, con interni di botteghe, o strade brulicanti di cittadini o donne al lavoro, o caffè e osterie e molto altro ancora. In tutte queste scene, siano esse di interni o di esterni, dominano la ricerca sulla luce, la libertà e l’incisività del tratto oltre ad una perfetta padronanza formale.